For definitional purposes, the following are provided to clarify the concepts. There is not general definition with each jurisdiction providing their own twist. The following are standardized and taken from the Federal Omnibus Budget Reconciliation Act (OBRA)[ 42 CFR488.301] documentation that is used for nursing home assessment of the issues. Abuse is the willful infliction of injury, unreasonable confinement, intimidation or punishment with resulting physical harm, pain or mental anguish. Neglect is The failure to provide goods and services necessary to avoid physical harm, mental anguish or mental illness. Abuse and neglect occurs in the home as well as an institutional setting like a nursing home or assisted living facility. There are no statistics on the number of community based abuse and neglect occurrences, but some literature suggests it is similar to the rate of child abuse in the community. When the mistreatment happens at home, it is often at the hands of a caregiver who can be a family member or a hired attendant. The role of the caregiver changes as the disease process progresses going from shopping, bill pay and managing medications. As the disease processes become more disabling the caregiver becomes more profound including based nursing care like bathing, hygiene, toileting and feeding. It may become a full time job for the primary care giver. The abuse can be a single incident or occur multiple times. There are a number of patterns that make mistreatment more prevalent. Some of those clinical situations include: advanced age due to more frailty, dementia or cognitive impairment like Alzheimer’s, behaviorally impaired seniors who verbally or physically strike out, mental confusion from any source, inability to communicate and disabilities of functional capacity like toileting, eating, bathing. These patterns of care or disability require a heightened level of care, attention and support by the caregiver thus increasing the level of stress. Caregiving can be local or long distance. Both situations are stressful. When the caregiver has reached his/her level of maximum tolerance, mistreatment situations exacerbate. The compassion fatigue takes its toll. The mind and body are on overload and tolerance for situations is diminished due to the level of stress. The caregiver often has no one or no place to turn to for relief of their stress and often do not even recognize it until it has consumed their lives. The Agency on Aging has good resources for the senior and their caregiving family members at http://www.ncea.aoa.gov. Discussion of the types of senior mistreatment are as follows. While it would seem that this would be one of the easiest types of mistreatment to identify, it is not always so. One must understand the normal process of aging and anticipated changes to recognize abuse situations. If there is bruising and skin tears on the arms, it may be due to blood thinner and the normal thinning and loss of elasticity of the skin rather than physical abuse. If the senior has bruising around the arm, bruises that fit a hand print, bruises that show finger marks on the arm, bruises in unusual places like the abdomen or black eyes, this discovery should be assumed abuse until proven otherwise. Discounting the senior’s mental health and psycho-social well being is considered psychological abuse. It is sometimes termed emotional abuse. The caregiver is intentionally acting in a way that causes the senior mental pain, anguish or distress. Situations might include a family caregiver not allowing other family members to visit the seniors. The scope of this problem may be difficult to identify because the outward signs and symptoms are less visible. Depression, withdrawal, tearfulness, fear either verbalized or visualized and lack of response can all signify this type of abuse. Sexual activity can continue throughout the life span because it is a normal human process. Seniors with partners continue to be sexually active into their 90’s and beyond. Families are not always comfortable with this sexual activity and it can occur in nursing homes or assisted living facilities. If the senior is alert and can give consent, this is not considered abuse. In fact, it is abusive to separate the seniors on the basis autonomy, dignity and intimacy needs. Sexual abuse is not the same as normal sexual activity. 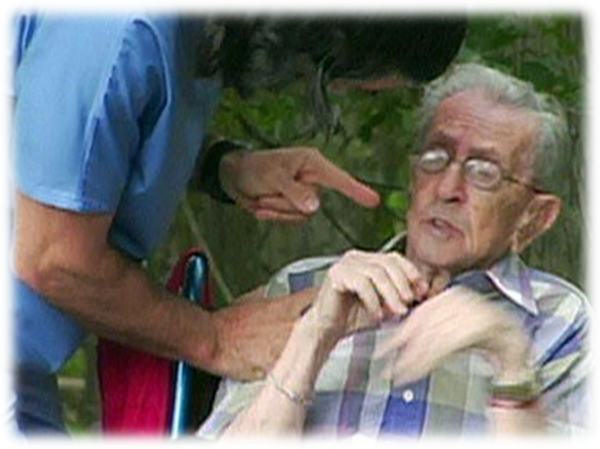 The caregiver in the power position is forcing the senior to have sexual activity under duress. Signs and symptoms of sexual abuse include vaginal or rectal bleeding, sexually transmitted diseases, vaginal discharge or bruising of the chest, breasts or genitalia. Senior females fearing a pelvic exam may be an indicator of sexual abuse. Neglect occurs whether the caregiver is family, friend or a paid resource. Neglect is not always easy to recognize due some of the normal changes seen with aging. Some of the suspicious signs of neglect include substantial weight loss, bed sores, lack of hygiene, soiled clothing or incontinence products, history of repeated falls, physical withdrawal when the senior is approached or social withdrawal. Neglect is often a pattern of behavior that is evidenced by healthcare practitioners, family or friends recognizing changes over time that are inconsistent with expectations of observed outcomes. Especially in situations where the senior has cognitive impairment, a dementing disease or a behavioral health disease, they may neglect their own needs. It is imperative that friends, neighbors or family be made aware of this situation. The senior is not able to act on their own behalf and must have other act for them. It may require police involvement or court action to provide a safe place for the senior. If you walk into a home that is filthy dirty, dishes with mold in the sink, the senior smelling due to lack of hygiene, no food in the kitchen cabinets or refrigerator, self neglect must be considered. Even if the senior is alert and able to make their own decisions, they have demonstrated that their decision making is flawed and they need assistance. Call your local Agency on Aging for assistance. Seniors are often trusting and more easily duped. They are often physically and socially isolated. Even when they are alert and have their cognitive faculties they may be financially exploited. Financial exploitation is using a senior’s assets or financial resources without the consent or authority of the senior. One area that may be overlooked is exploitation by hired live in caregivers. These individuals may be the only social connection to the world and provide for all of the senior’s needs. They, and other that are likely to exploit seniors, may have access to mail with credit card account numbers, bank account statements, investment accounts and the senior’s check book. The senior may have vision loss and not be able to pay bills which is delegated to the caregiver or attendant. Regardless of the type of abuse or neglect the senior is experiencing, it is up to those of us either providing healthcare oversight and care or family or friends to advocate for the vulnerable senior. As a healthcare provider, many states have mandatory reporting of suspected abuse or neglect. The law looks to anyone aware of this behavior to report and act on behalf of the senior.